Wauwatosa, Wisconsin. GILTEE is a small design and print shop. Founded in 2015, owners Adam and Lisa Gilson are spreading love for their Wisconsin roots through creative and unique designs on high quality apparel. GILTEE apparel is hand screened on premium, ultra-soft, lightweight clothing. While this started as a hobby, the couple enjoy working together to grow their business. Adam continues to work as a graphic designer, and Lisa has put her teaching career on hold to stay home and care for their two children while managing their business. 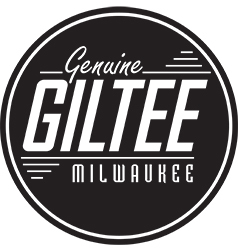 GILTEE apparel is the perfect gift for any lover of all things Wisconsin.